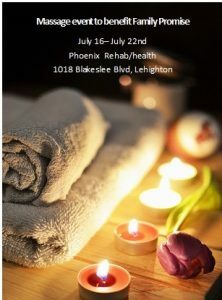 Drop off a donation for Family Promise of Carbon County at Phoenix Rehabilitation, 1018 Blakeslee Blvd, Lehighton during “Everybody Deserves a Massage Week”, July 16- July 22nd and you will be rewarded with TWO- 60 minute massage certificates. This local event is part an award winning national celebration. Professional massage therapists join volunteers from the Associated Bodywork and Massage Professionals trade organization in this public service to promote the many benefits of massage therapy. Local volunteer, Connie Kates-Williams is responsible for suggesting the idea to benefit Family Promise. Community members can drop off monetary donations to Phoenix Rehabilitation and Health between 9am – 3pm for the duration of the massage week to receive the TWO massage certificates. In the spirit of giving the idea of TWO certificates is one for the donor and one to pass on to a friend or loved on. This is a fantastic opportunity to support a worthy cause and be rewarded too. Monetary donations cannot be accepted at the Family Promise day center. In order to participate and get the TWO- 60 minute massages donors must visit Phoenix Rehab during “Everbody Deserves a Massage Week.” While donations must be made during the designated event to qualify, the massage certificates do not have an expiration and can be used at a later date. Let’s set a goal of $3,000! Massages are a great treat as birthday and anniversary gifts and it is never too early to start stocking up on holiday gifts!